Low Inventory > JAPANESE > NEW! The Terror of Tassafaronga Point - Guadalcanal 15 October, 1942 is the second image in the New United States Marine Corps Aviation - Pacific Theaters of Operation Series, one of the two which relate to the legendary action of Major Jack Cram on 15 October, 1942, during the darkest days of the Guadalcanal Campaign when the marines needed miracles. 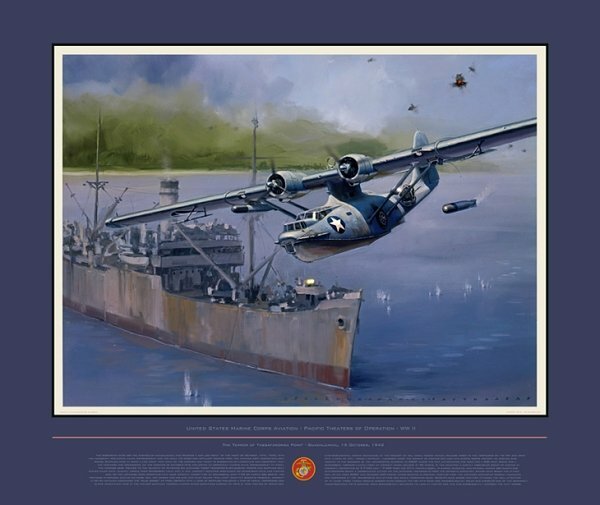 In this painting - which is in the permanent collection of the US Marines HQ - Guadalcanal Air Boss USMC General Roy Geiger's junior aide and personal pilot, Major "Mad Jack" Cram is seen the moment he released the first of two aerial torpedoes against the six Japanese troop transports that were unloading troops and supplies only eleven miles from Henderson Field on Guadalcanal, Major Cram sank one of the transports as a result and was subsequently awarded the Navy Cross for this action.